There are many ways to be a hero. I by no means denigrate our men and women in the armed services, who have given their all recently in two wars (one of which should never have happened). But, there are heroes in everyday society, and that includes a lot of artists! One of the most important things about the history of art is that it records the state of humankind when the art was produced. This idea influences style and subject matter. In the Italian Renaissance, it was important for artists to stress the classical knowledge of their patrons, as well as express religious conviction (since the Roman church dominated art patronage). During the Great Depression (1929–1940), the precursor of the second worse financial downturn—the Great Recession of 2008, instead of relying on mythological, religious, or historical subject matter, many artists during the Great Depression preferred to document what was happening to ordinary, hard-working Americans. One of the major sources of the Great Depression was the depletion of top soil in America’s heartland, due to unwise over planting and no attention to water. After the Wall Street bankers caused a collapse because of speculation in many areas, the decline in crops (caused by the decimation of the natural eco-system because of over-planting), fostered the Great Depression. Dorothea Lange studied photography at the Clarence White School in New York and after that opened a portraiture studio in San Francisco in 1919. She was very successful for about ten years, turning out pictorialist style, soft focus portraits of mostly wealthy people of San Francisco. The heavy onset of the Depression in the early 1930s caused her to reevaluate the value of providing flattering portraits for the wealthy while so many people were jobless and homeless. This discrepancy caused her to begin to take photographs of the hapless people living on the street. At first she was not sure what purpose her photographs of the jobless would serve, but she gathered them into an exhibition in 1934. They came to the attention of the Farm Security Administration, and she was hired in 1935 to document migratory farm workers in the Imperial Valley of California. Unlike the other photographers hired by the FSA, she was not required to move to Washington, DC. After the Imperial Valley photographs, she was asked to travel about the Midwest and west to document the huge exodus of displaced farmers who were migrating to California to look for work. This photograph comes from that series. 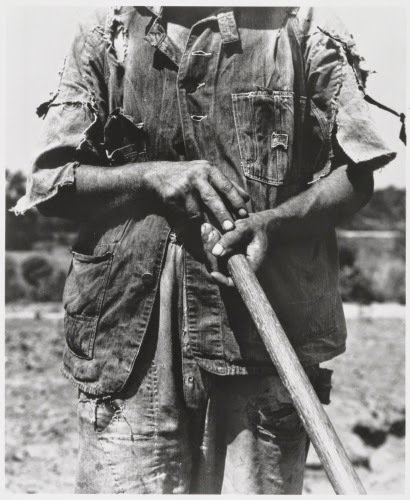 The US government, under the auspices of the Historical Section of the Farm Security Administration (FSA), sponsored the photographic documentation of the plight of tenant farmers and farmers displaced by the Dust Bowl in the Plains states. The original intent behind the photographic program was to record the activities of the government in helping destitute farmers. Ultimately, the stirring photographs of human suffering caused by the Dust Bowl and Depression moved the government to further action to help people. Among the eleven photographers who worked on the project, the photographs of the humanist Dorothea Lange had perhaps the strongest impact on the American public, and are the most recognized symbols of the Great Depression. Lange was particularly moved by the plight of tenant farmers, both black and white, who had no claim to their land, and yet depended on it for survival. The calloused hands and stark close-up without revealing a particular individual, for Lange, summed up the plight of tens of thousands of tenant farmers who had no recourse but to try to stick it out. Lange also documented the many tenant farmers who thought it was a good idea to uproot and move to California, which was unaffected by the Dust Bowl. Lange’s photographs were viewed by Congressional committees, and are credited with being responsible for the establishment of migrant camps in 1935. Her photographs of the migration of farmers from the Midwest are also thought to have inspired John Steinbeck to write the book “Grapes of Wrath.” After her work with the FSA, Lange went on the rest of her life documenting the human condition in many parts of the world.